Target has initiated a recall of unsafe Circo and Xhilaration brand children’s pajamas. The Circo and Xhiliaration brand cotton and cotton/fleece two-piece pajama sets are made for infants and toddlers. They can be returned to any Target store for an immediate full refund. 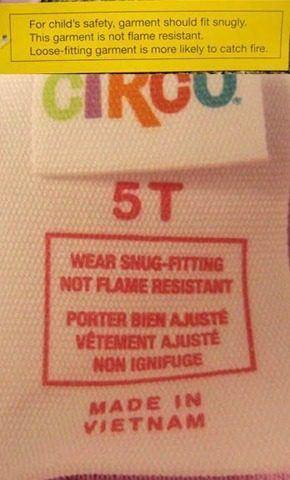 The pajamas actually have a tag on them that states they are not flame resistant and should be worn snug-fitting. That doesn’t meet federal flammability standards for children’s clothing. The clothing poses a burn hazard for children specifically because they are not form fitting or flame resistant. The large amount of free space between the clothing and the skin creates a large pocket of air which increases the likelihood of children being burned if the clothing should catch fire. The lack of flame resistance also makes it more likely the clothing will catch fire. The unsafe toddler and infant clothing being recalled by Target is identified at the CPSC.gov web site (http://www.cpsc.gov/cpscpub/prerel/prhtml13/13093.html?tab=recalls). Target has also included a list of the product item numbers on their web site (http://www.target.com/HelpContent?help=/sites/html/TargetOnline/help/product_safety_and_recalls/children_and_baby_products/details/1_10_13_Tightfit_Sleepers1.html). The sizes of the clothing are 12M, 2T, 3T, 4T and 5T for infants and toddlers. The children’s sizes for both boys and girls include XS, S, M, L and XL. The colors and styles widely vary, so consumers are advised to consult the list of items and immediately return them to Target for a full refund. Federal law prohibits the sale or resale of recalled products. Refunds are simple and easy to obtain for the Target recall of Circo and Xhilaration brand children’s pajamas. Do you have any of these children’s pajamas and have you returned them? Let me know how your experience went in the comments below!